British Tour de France winner? Time to wear the yellow again! When Bradley Wiggins won the Tour de France in 2012 I rode round the UK countryside like I had won the race myself. 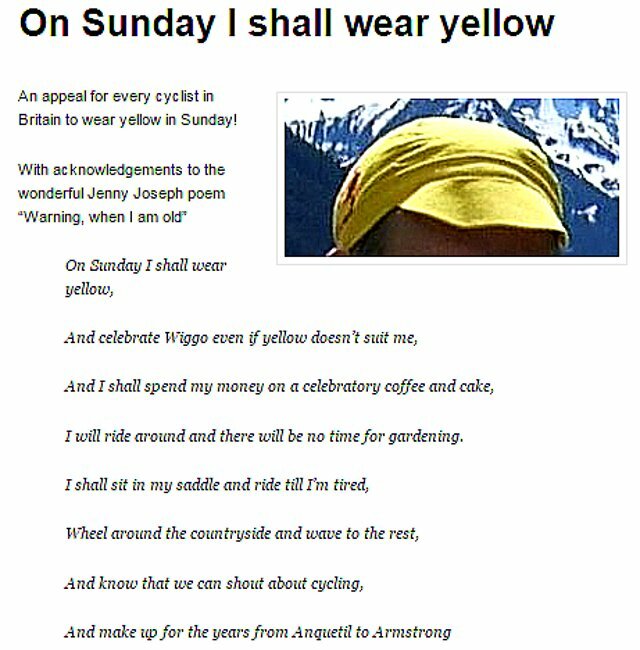 And it inspired one of my personal favourite posts on idonotdespair.com “On Sunday I shall wear yellow”. It is one of favourites because I had so much fun writing it and I was on a euphoric high of fandom. Back in the summer of 2012 not so many people read my blog, but it did get a link in the weekly CTC newsletter so it was probably my record number of views at the time, therefore I was even more chuffed. And any excuse to listen to the wonderful Jenny Joseph poem I plagiarised is a good one. I may even have gone a bit over the top around the same time when I took on the mad Norwegian football commentator challenge. Then in 2013 Chris Froome became the second British winner so I could don the yellow again, this time to ride out with my new Belgian cycling club which caused some smiles. It is almost inconceivable that since 2012 there have been 3 British winners of the tour after 100 years of occasional flurries and few stage wins. So on Sunday I feel I have no choice – it is out with the faded CTC yellow top again to celebrate Froome’s victory. A bit smug perhaps in the land of Eddie Merckx, the poor old Belgians haven’t had too much joy in the tour of late although Greg van Avermaet and Serge Pauwels gave them some good moments and the Belgian teams Lotto and Etixx have won a lot of stages. But Sunday will be our day. On Sunday I shall wear yellow. Now I wonder if Cavendish can do something special on the Champs?